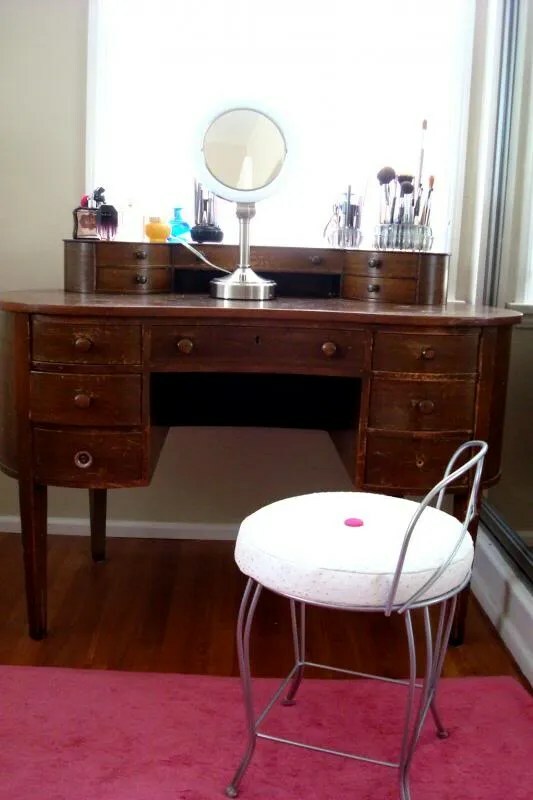 I’ve been hating the chair I’ve been using for my bedroom vanity. It’s too wide, it’s always in the way and it’s too tall. It’s a good chair in the wrong place. The search was under way for a vintage stool. 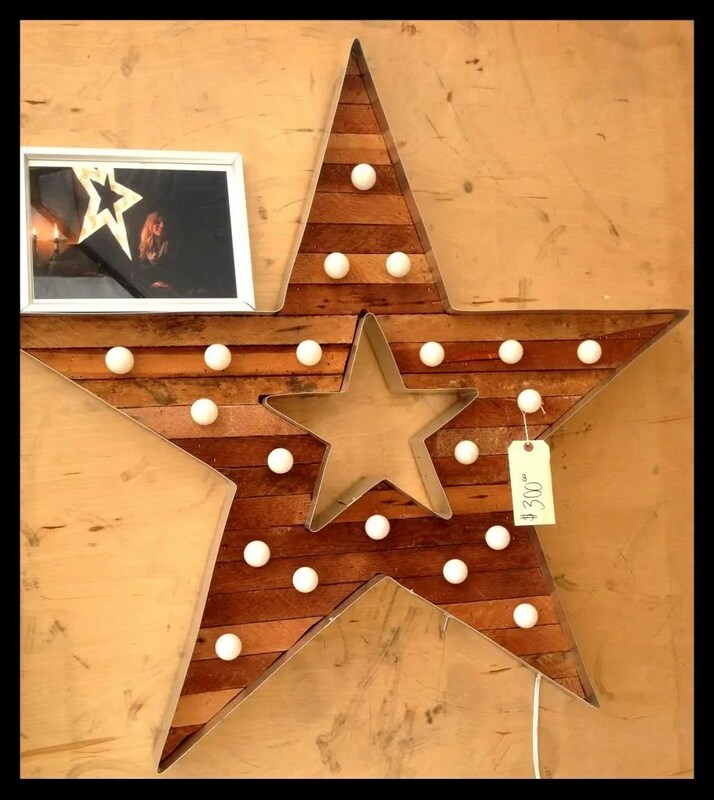 I had a really fabulous one but Thing 2 desired it for her room and it fit her bedroom décor perfectly. Besides, I needed something with a smaller footprint that could almost disappear in my tiny bedroom. It also needed to be a lower so I can see into my make up mirror. I felt like I’m hunching over my mirror – something I’m not used to since I top out at 5 foot. Last Saturday, on my way to get the Prius a badly needed wash I spied an estate sale. I love a good estate sale. Especially if it’s a TRUE estate sale – not a “we think our crap is nicer so we’re calling it an estate sale.” I love to walk in and feel like I’ve stepped into the past. The furniture, the carpet, the appliances, Grandma never updated. These are the types that yield treasures. It looked like slim pickings as I walked in. I chose the path of least resistance – choosing the less crowded back bedroom. There it was – sitting by itself and ignored by everyone else. 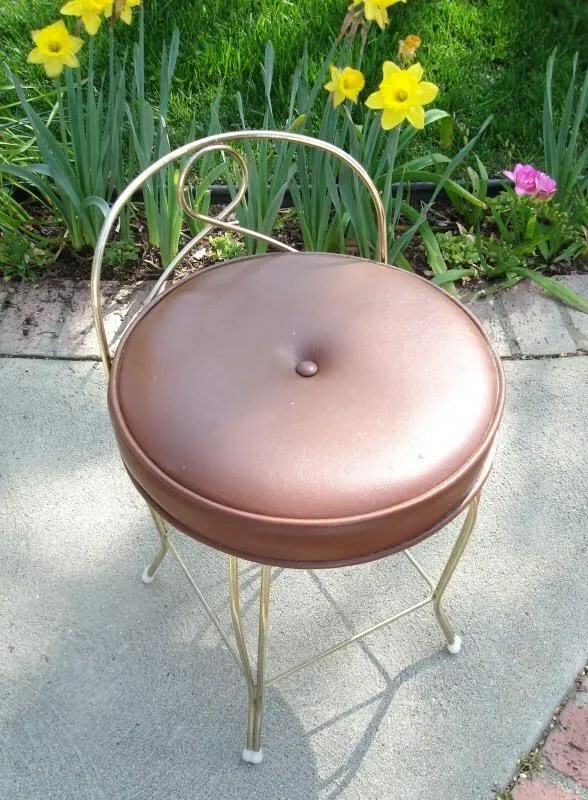 Who would want this drab little stool with its tacky brass and brown combo? Me! Me! Oh, I’ve been waiting for you! The vinyl brown cover was carefully removed and a pattern was made. The frame was sanded down and gilded with pretty silver finish. A small piece of faux white ostrich leather fabric from my stash had been saved just for something like this. 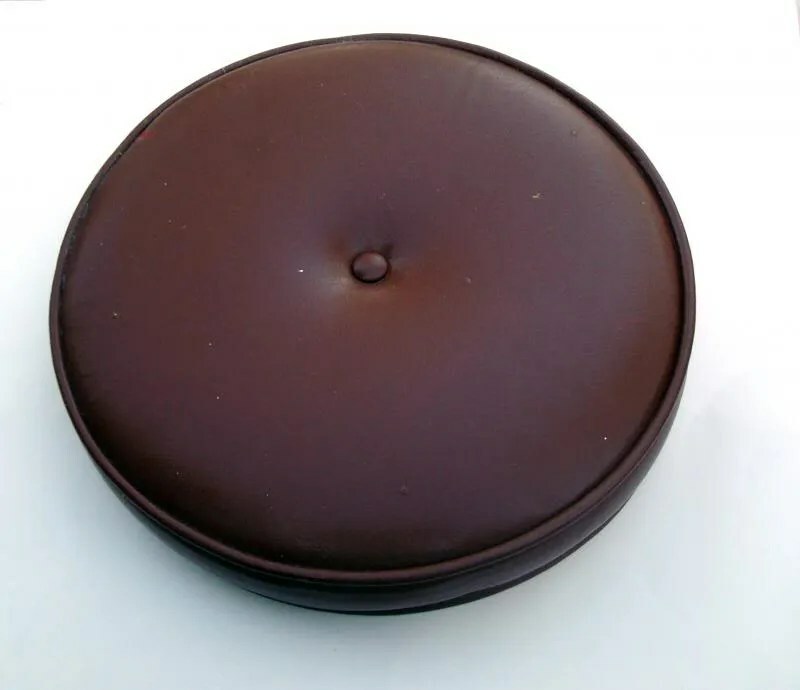 It was sewn into shape and a new button was fashioned with pink fabric just to lighten things up a bit! It’s sooooooooooo much better now! The stool takes up less room. It’s the right height and it feels oh so glamorous! I planned a date with my friend to attend the Pasadena Rose Bowl Flea market. It’s always fun to attend and I just happened to have a list of several things I needed to get there – like two crystal drawer pulls for my entry way desk (it was missing two) and one drawer pull for the serpentine dresser (it came missing 1 out of 8 pulls). Thing 2 and I have also been looking for the perfect mirror to put over the Grady Hunt desk . Not even five minutes in, I found an adorable round vintage mirror. It was a great deal so I went ahead and bought it. That’s a little hasty but I knew in my heart it was right. During the rest of our trek around the bowl I never saw another mirror that would have worked as well. 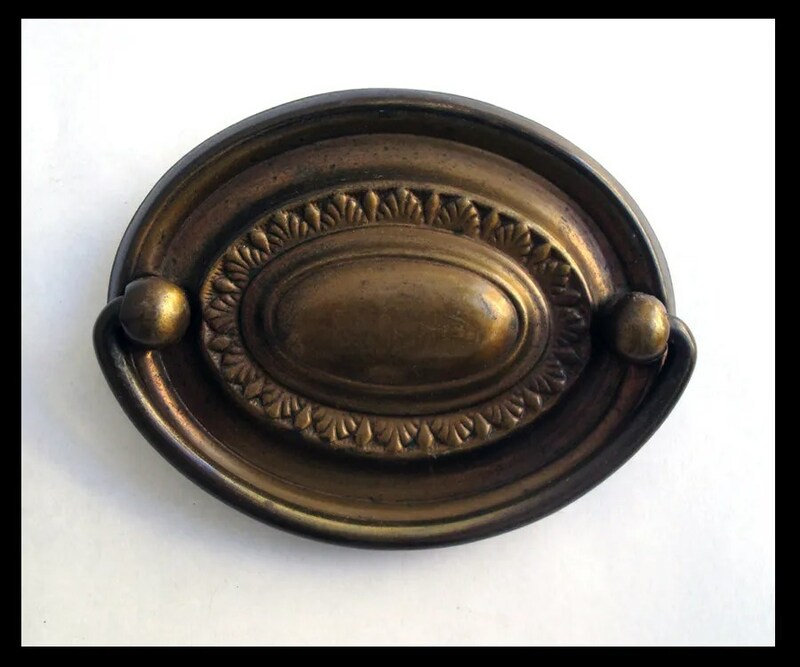 Then we came across a vendor selling vintage knobs and pulls. I easily found two crystal knobs that matched the ones I had. 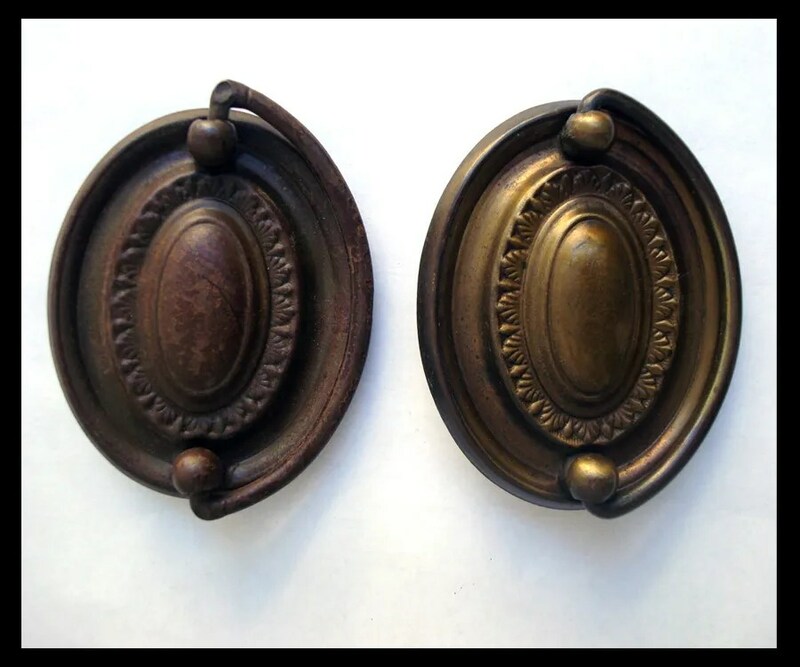 They also had a box of brass pulls and while I found several very similar to the Dixie pulls, none were an exact match. I resigned myself to finding something new. Finding the exact match might be impossible. The other cool thing about the Rose Bowl Flea Market is that you get to see some creative uses of vintage treasures and furniture and other odd bits. There’s also some interesting people there. Like the character that was selling mismatched vintage jewelry. My friend and I got waylaid at his booth. He was hawking his wares like a seasoned Carney – yelling out different prices depending on the person who approached… In the end, he made us a great deal and she and I both found some great pieces. 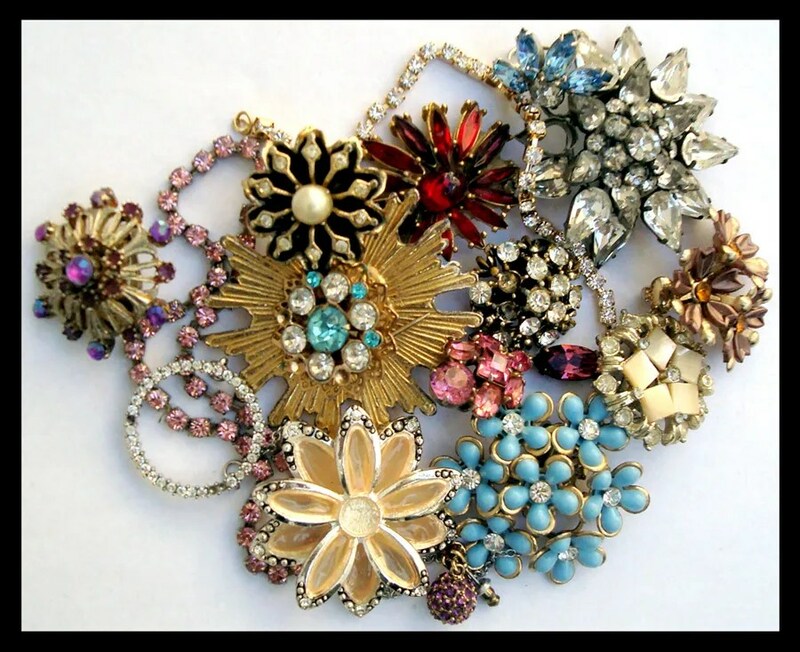 I think I’ll incorporate mine into a bracelet or necklace…. or maybe even a purse. 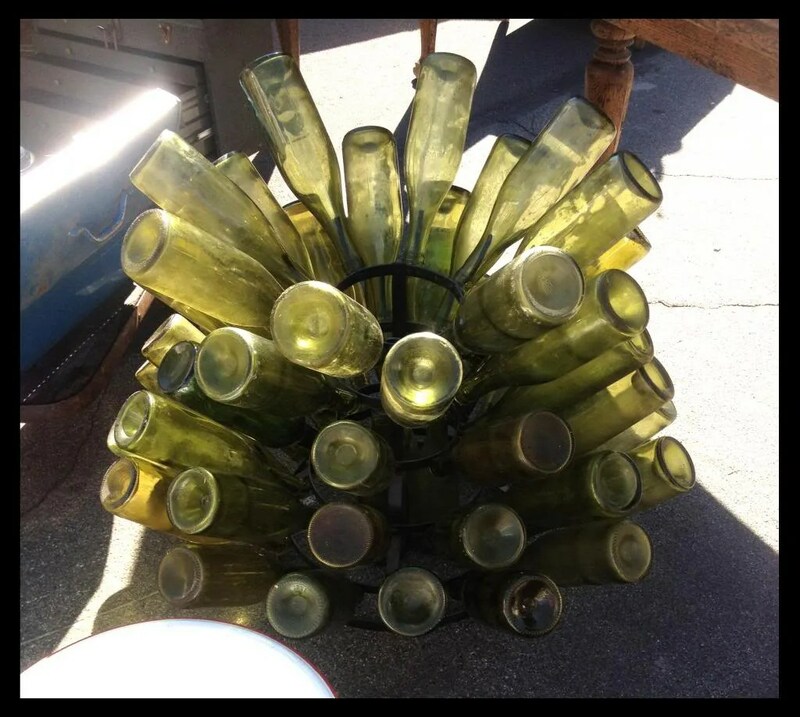 I’ve been on the look out for a vintage bottle rack – I’d love to leave it on my counter. This would be a quirky drying rack since I don’t own a dishwasher. 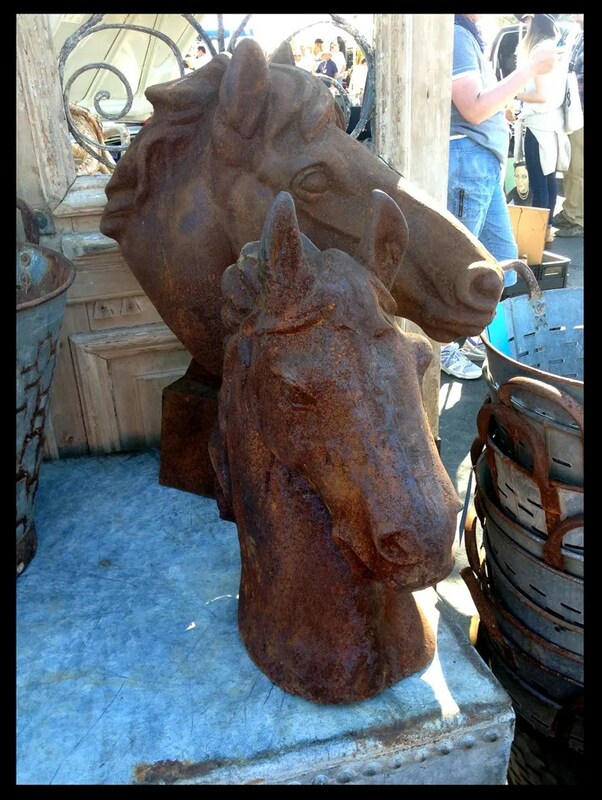 LOOK at these rusted horse heads – they were solid iron and weathered and just gorgeous! I think I need one, my carousel horse needs a friend. 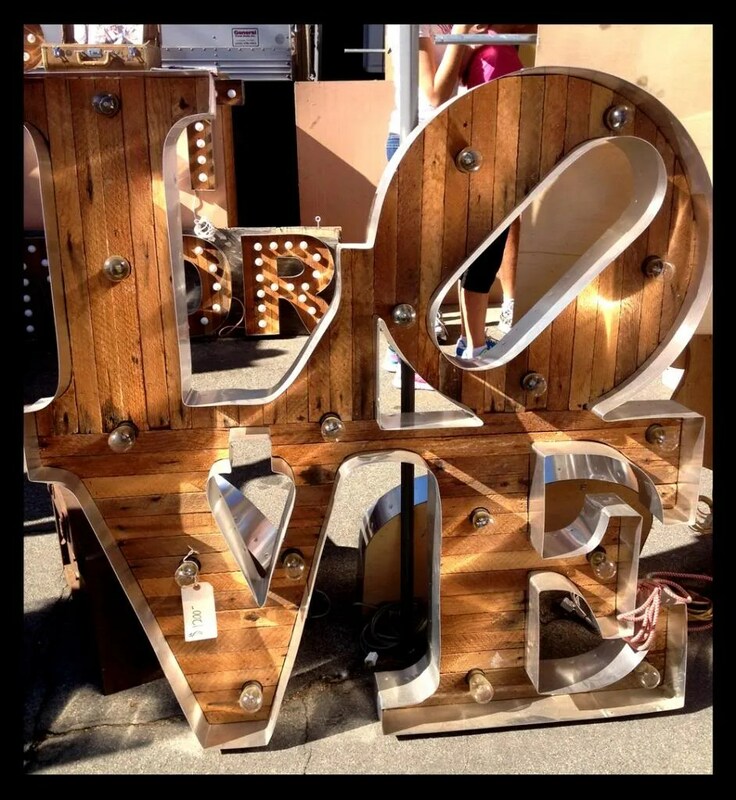 How lovely are these lighted pieces from Coppersmith Designs? They look simple in design; the lights are set in wood with a metal frame housing. But when you turn the lights on, the lights reflect inside the frame. I’m sure you could make one if you’re the slightest bit crafty, but they were so reasonably priced. The star might have to live on my back porch. It would be a fun way to add lighting back there. 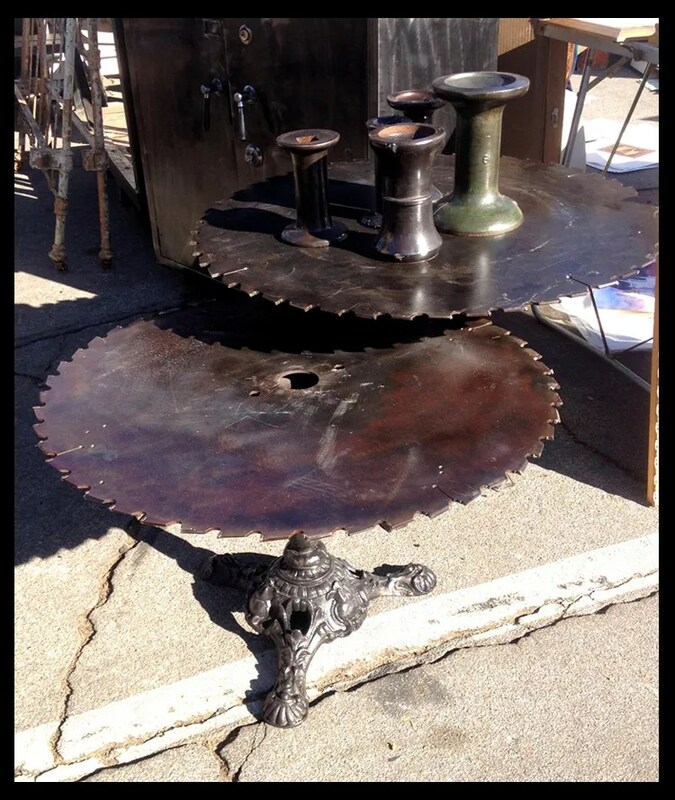 Not on my list but definitely fun were these tables made from metal saw blades. I didn’t particularly like the base they were set on but the blades used as a table top had a great patina and a lot of interest. 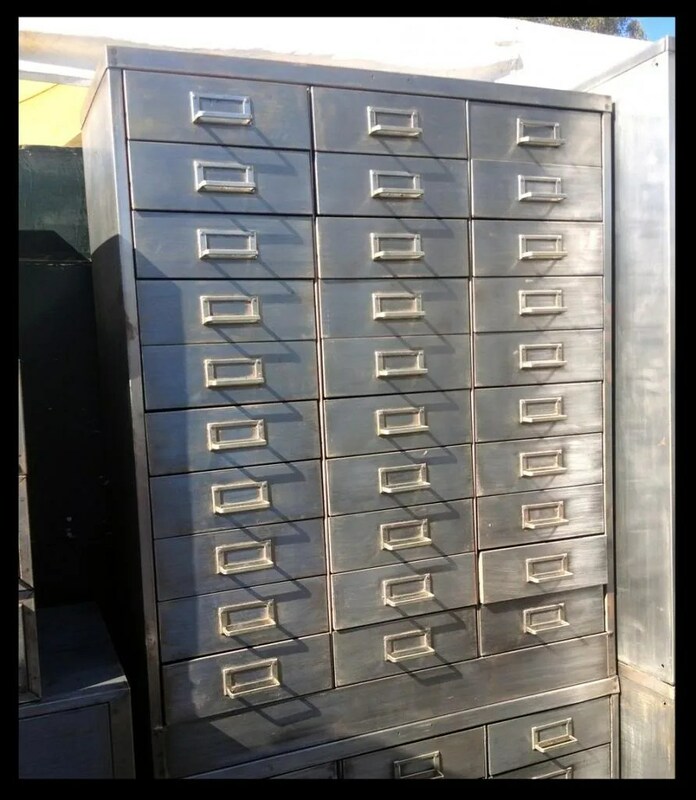 Up for consideration were these steel cases with metal drawers. Each drawer is wide enough to hold 8 ½ x 11 paper. The kids always need lined paper or printer paper on hand. Think of all the craft supplies that could go in here! Their pieces ranged from $200 to $500. While I love the industrial look – I’m not in love with the bare stripped finish. Maybe a deep golden brown finish would blend it in a little better? Or painted a bright color? Open to your suggestions here. At the end of the day we stopped by one last vendor and searched through his bins of mismatched pulls. Unbelievably, my friend’s quick eye found the EXACT match! That’s why she’s my wing man for Rose Bowl! Can you tell which one is the original? I can’t wait to go back! I occasionally suffer from furniture envy. 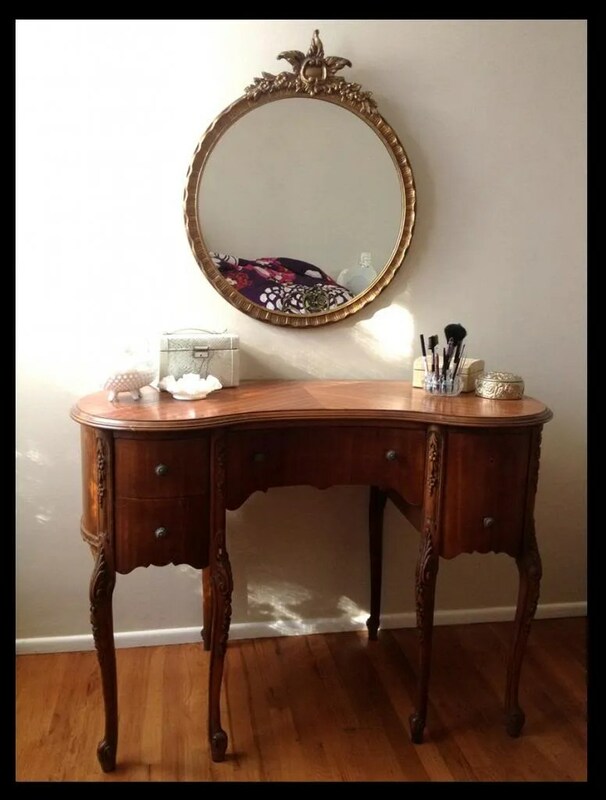 My friend Kat once had a tall serpentine dresser that looked like it had been painted over about 10 times. It had this cool aged patina that was mottled with different colors showing through the top coat. 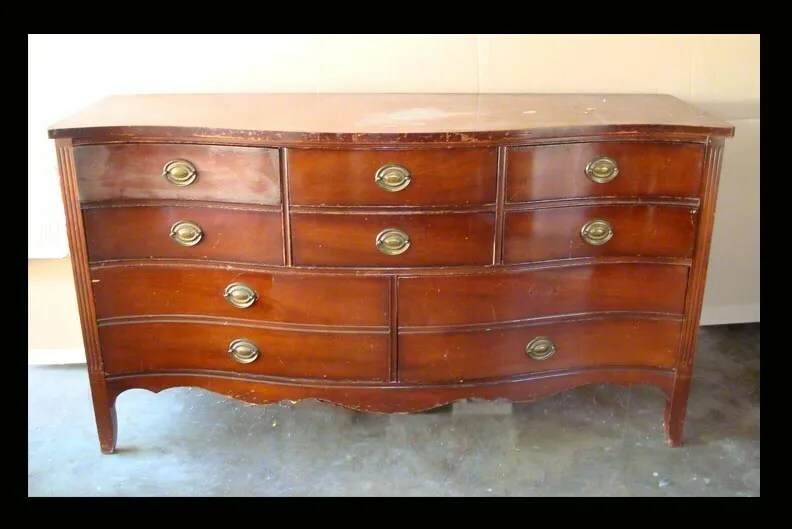 The drawers bowed outward so it had a lovely curvy figure. I admired that dresser of hers. She sold it long ago (the multiple colors probably messed with her OCD) but I’ve been on the lookout for my own. I scoured thrift stores, estate sales but never seemed to find the right one. Came close once – and for $35 bucks in pristine condition –it was a steal. But it was too long and it never would have fit in the apartment bedroom. Early into moving into the bungalow I found this one. I knew it was the right one. Not too big – not too small. Just the right height – (slightly higher than my bed foot board) A pretty curve to the front. Nothing too crazy on the woodwork. Perfect. Except… the finish. And that can be fixed. Buying the dresser soon after I moved in had its challenges. I had just cleared the garage of boxes only to now store this sizable piece in there. 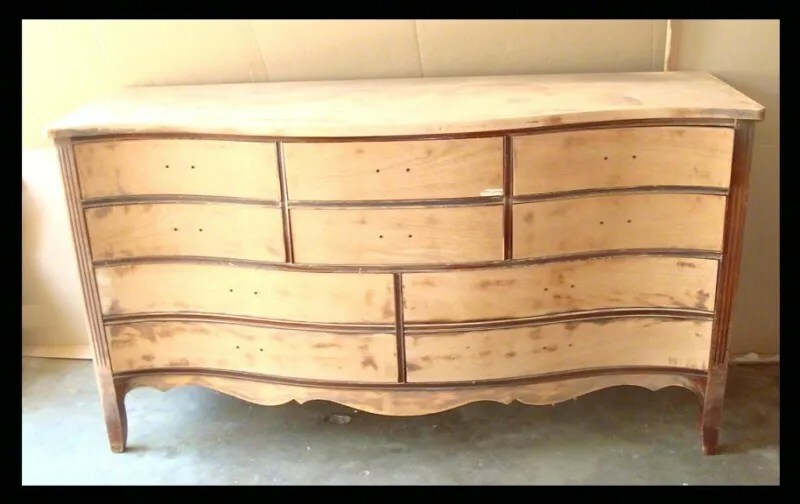 My car would have to wait – the dresser has to live there until I can finish sanding it and painting it. It’s also been hot as hell this summer. 106 in the shade… The only time I’ve had to work on this piece is early weekend mornings. Here it’s sanded– the bare wood almost ready to accept a first coat of white primer. The dresser came missing one pull – it will need a replacement or maybe find new ones. One of the bigger drawers was coming apart – easily fixed with a little wood glue. But painting process has been painstaking slow. Essentially, I’ve been painting one thin layer on a Saturday morning, one thin layer on Sunday, and using a fine sand paper grit in between. I started with thin coats of Kilz primer as I like the way it coats and hides the areas that resisted sanding. I love white furniture but felt this piece needed a little something (not “bling” not “pop” please stop using those words, they are over used, tired and need break). Just a little hint of color and sparkle. I’ve been using a Benjamin Moore pearlescent glaze called simplicity (pink), applying one coat at a time. Frustrated with the heat and the lack of progress I brought the drawers inside. They needed to be cleaned from the original sanding and dirt anyway. I discovered that someone had used this dresser or arts and crafts or sewing storage. I loved that there were sewing pins stuck in the cracks and flecks of crayon and paint. A generous coat of wood wax was applied to the sides of the drawers – protecting the unpainted part of the drawer and giving it a nice, buttery finish. Lastly – I’ve been spraying thin coats of clear lacquer to protect it and give it a super shiny finish. It’s almost done! Remember the vintage desk that followed me home? The one I bought at the Grady Hunt estate sale? I had all the best intentions in the world to sell it, but then didn’t have the heart. Now I know why. The Lake Balboa Bungalow has one small bathroom and with two preening girls in the house – it was mandatory that we each have an area in our boudoirs dedicated to all things pretty. Thing 2 wanted the new desk – the pretty, girly Grady Hunt desk. It seemed fitting for an aspiring actress to acquire a desk that belonged to a famous costume designer. My old, kidney shaped desk has been with me a long, long time – it has served me well and it seemed right that I remain faithful so I placed it in my room. Moving is hard on everything. I think I mentioned that I packed everything to withstand the space shuttle launch. I only lost two cheap glass vases in the move,– thankfully none of my lovely milk glass. But the movers, as good as they were, left a big, nasty gouge in the Grady Hunt desk, a large scrape in my kidney shaped desk and a gouge in the floor. I sent them pictures and they sent over their repair guy who was the bomb. 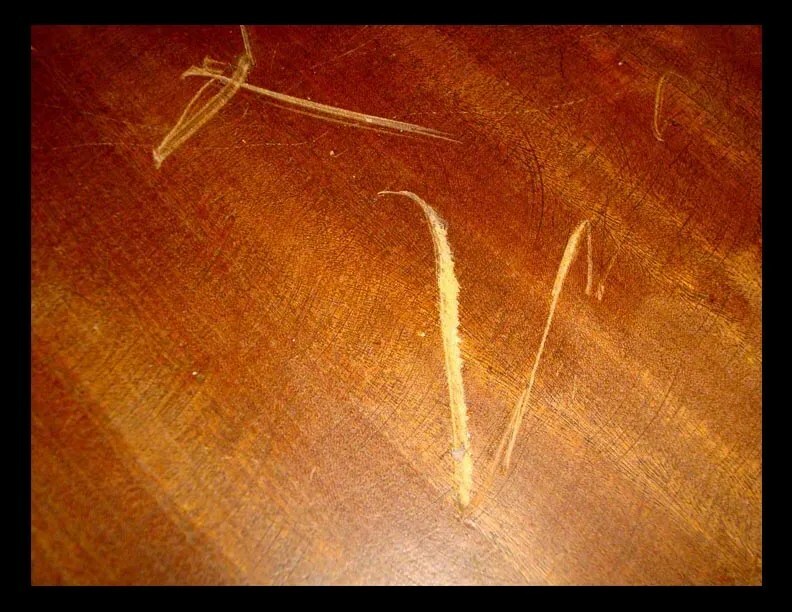 Joseph fixed the gouge in my wood floor – I couldn’t even tell where it was. I believe he’s capable of restoring historic masterpieces – so fine was his work. In order to fix the gouge in the Grady Hunt desk, Joseph had to take it back to his shop to sand it down. I helped him remove the drawers since he wouldn’t be needing those. As I removed the last drawer, I could see that there were some papers that had fallen back and got stuck behind. Expecting just junk, I was stunned to find nothing less than the last will and testament of Grady Hunt and William Jobe, Jr. The two wills, dated 4 August, 1956 were folded together and cited each other as the executor of their wills. How lovely. Two men, whose relationship in 1956 surely would not have been publicly accepted, obviously had formed a deep and meaningful bond. I wondered about what their lives must have been like. As a costume designer, Grady might have been suspected to be gay, possibly whispered about in hushed tones or alluded to with a laugh. While there was probably more tolerance in the Hollywood community than elsewhere, I’m not sure that the two would have been open about their relationship. Did they attend glamorous Hollywood parties together? I wondered how these two met. I searched census data and found the records of the parents William cited in his will. William was born and raised in Tulsa Oklahoma – how did he find his way to Hollywood? And I wondered about their love. 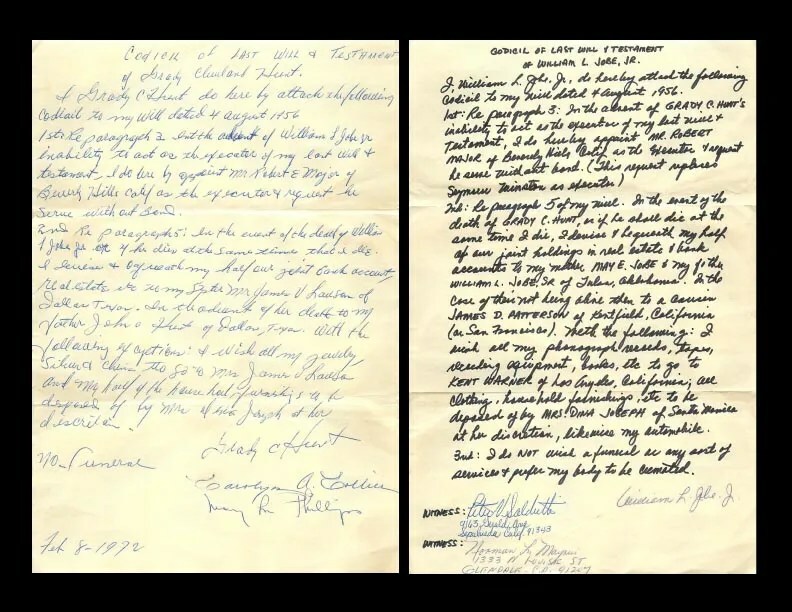 Grady’s will is marked again at the bottom of the will with a date of February 8th, 1976. Did their love last over 20 years? I want to believe this! I want to believe that these two men lived glamorous, happy and love filled lives. And the desk, which spoke to me before, tells me this is so. KarenHello. What size paper cone did you use? Thanks. 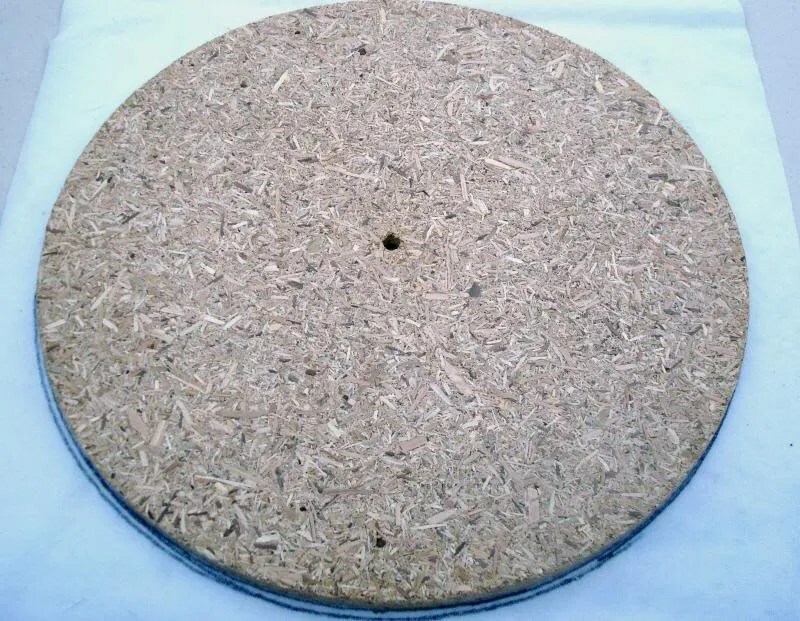 cheri kalcicWhat size cardboard cone did you use? It’s only Rock n Roll….